1. Lay your wedding invitation down with the wording face up. By the way, this is also the perfect time to admire your gorgeous invitations. 2. 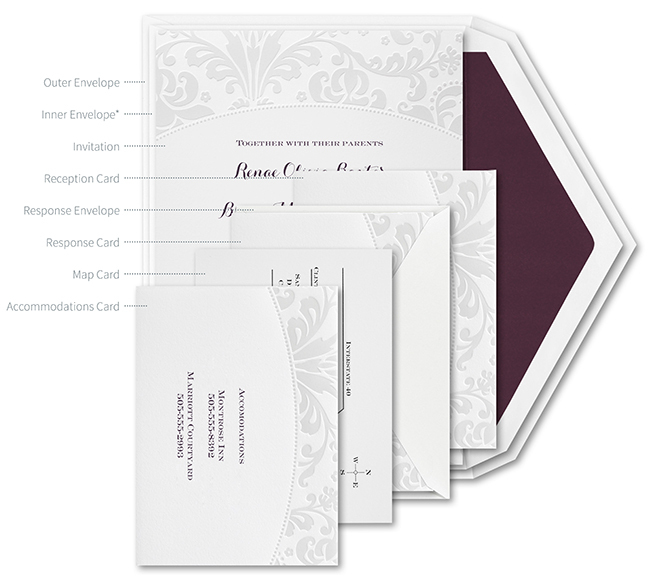 Place the reception card on top of the invitation with the wording facing up. 3. Tuck the response card, wording face up, under the response envelope flap and then place it on top of the reception card. 4. If you have any other enclosure cards place them on top, facing up. Proper etiquette suggests that the map or direction card is placed on top of the response card and the accommodations card would go on the very top. Have fun assembling! Now all you need is your wedding party to help you!